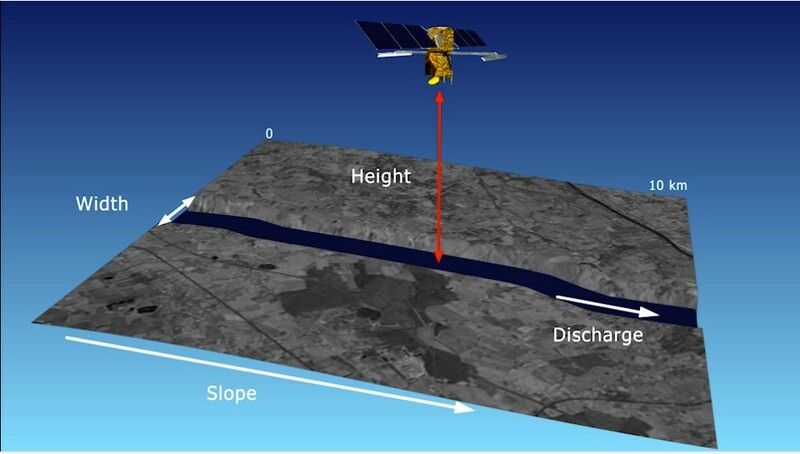 The Swot satellite will also survey rivers wider than 100 metres. Three products will be delivered to users. They will only be generated for rivers recorded in an existing database and will cover reaches of approximately 10 kilometres. The first of these is a reach product. 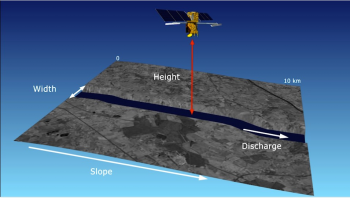 On each WOT satellite overpass, observations are attached to the predefined reaches stored in the database. This product provides the mean height, width, slope and discharge of the river for the reach in question. The second is a node product. A node is defined every 200 metres along the centre line of the river. This product provides the river height and width at each node. Finally, the third is a cycle average product. As with lakes, a river may be observed once, twice, three or four times, and even up to 12 times at high latitudes over each 21-day cycle. For each river section, the product compiles all data collected over the full cycle. It’s currently estimated that Swot will observe around 200,000 river reaches across the globe.